You can now own your own hard cover collection of my Baina Colonial comic. February 5, 2017 / Zahira / Comments Off on You can now own your own hard cover collection of my Baina Colonial comic. 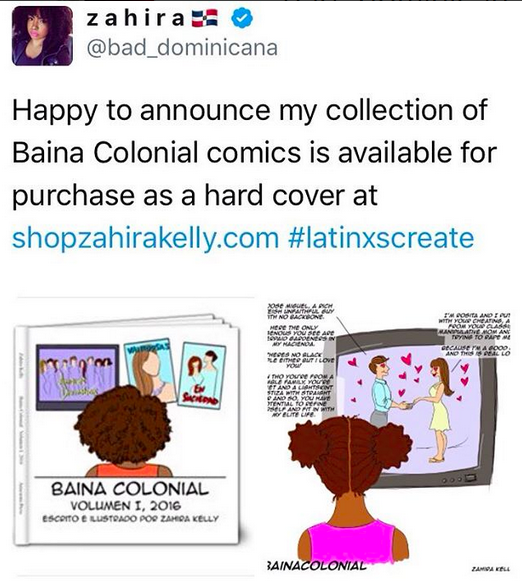 You can now own the bilingual collection of the first year of my Baina Colonial comic, which focuses on Afrolatinas experiences and invisibility in LatinAmerican media. Available for purchase at shopzahirakelly.com. See more about Baina Colonial at Zahira.co/Bainacolonial. Ahora puedes obtener la coleccion bilingue de el primer año de la serie de mis caricaturas Baina Colonial, la cual se enfoca en las experiencias de Afrolatinas y su invisibilizacion en los medios LatinoAmericanos. Disponsible en venta en shopzahirakelly.com. Puede ver mas sobre Baina Colonial en Zahira.co/Bainacolonial. Hard cover, 6×6″, Full color, Stitch bound. 2016 was a year of creation for me despite everything. January 1, 2017 / Zahira / Comments Off on 2016 was a year of creation for me despite everything. I have my amazing patrons at patreon.com/bad_dominicana to thank for allowing me enough sustenance to focus on creating more last year. It’s really improved my life and art and I am eternally grateful to all of you for the support. I was curious to see what I did throughout the year as I was busy cranking stuff out and not really minding how much. Turns out I did alot more than I thought. I compiled most of the visual stuff I created in this post. Most! This is not any of the writing, only a sliver of the shop merchandise, and there are more unfinished pieces, private commissioned pieces from my day job and freelancing, and artwork from projects and collabs that are going to be released later this year. *phew* It was a laborious, productive year. Here’s to 2017 taking us to new heights. 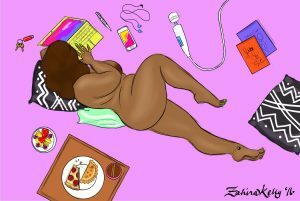 January 1, 2017 / Zahira / Comments Off on Antiblack Latin American Bingo! 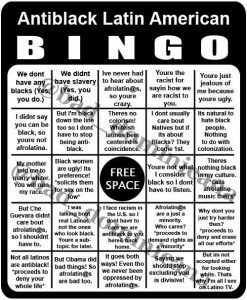 Every time they start up I end up reposting these Bingo cards I made a few years ago because it is all painfully repetitive. I’m like WIN A PRIZE, PENDEJXS! Explaining the current disconnect between nonblack Latin Americans trying to claim Black ancestry and Afrolatinidad.